uuid : 513ff7eb-9944-44f5-b311-bba3908149a4 templates_id: 119465 templates_uuid: "ba709c74-3fd2-486d-8a44-81b3b55f0ee7" title: "Living will - Advance Decision Template - Living Will Sample" display_name: "Living will / Advance decision" meta_keywords: "Advance decision and Advance directive" description: "
Make sure you have detailed instructions in place with this living will for when you are no longer able to make decisions for yourself. This advance decision covers circumstances in which you might not want to be kept alive artificially and allows you to set out specific instructions for medical treatment you would and would not like to receive. Use this living will only if you have discussed the matter with your GP and your family. A living will allows you to state your wishes regarding the way you are looked after in the event that you lose your mental capacity, including preferences for methods of medical treatment and refusal of certain types of treatment. A living will can refer both to an advance decision or an advance statement (which is a separate document). If you lose your ability to make decisions due to an illness (such as dementia) or an accident which results in a brain injury, you can maintain some control over your affairs with a living will. This often works in conjunction with a Lasting Power of Attorney (LPA). In the absence of any instructions regarding how you wish to be treated, you are more likely to receive care which does not fit with your beliefs (social or religious). 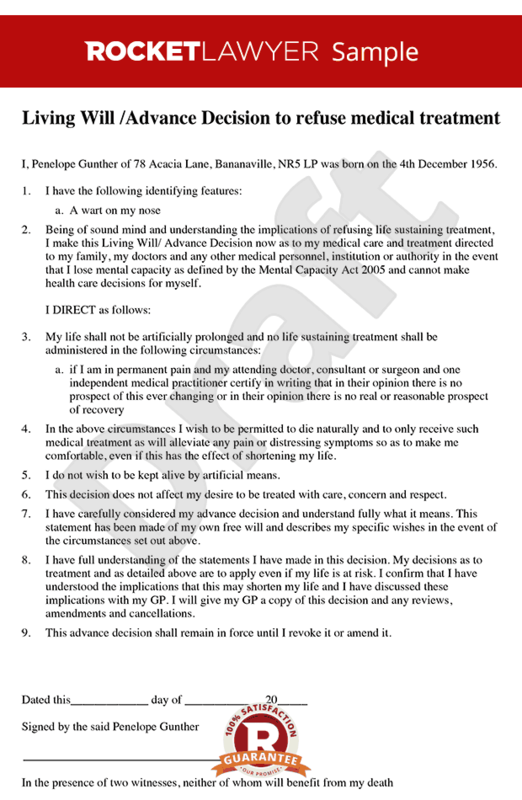 An advance decision is a document in which you can specify any medical treatments which you wish to refuse, so that doctors and other medical staff are aware of your decision in case you lack the mental capacity to state your refusal at the time (eg. because you have advanced dementia, brain damage or are unconscious). An Advance Decision should clarify the circumstances under which you do not wish to receive specified treatments, as far as possible. It only allows you to refuse certain treatments; not request them. Note that it can be used to refuse treatment even if doing so might lead to your death but it cannot be used to ask for your life to be ended. Unlike an Advance Statement (see below), an Advance Decision is legally binding. An advance statement is - a separate document, this sets out how you wish you be cared for if you are unable to state your preferences due to a lack of mental capacity. It can include a range of matters including dietary requirements and whether you would prefer to be at home or in a medical facility. It may also state any religious beliefs you hold which could affect the treatment you receive. It should be noted that an Advance Statement is not legally binding but doctors and others caring for you must take it into account. This advance decision is governed by the law of England and Wales.
" created_timestamp: "2018-10-08 04:36:08.0" modified_timestamp: "2018-10-08 04:36:08.0" active: true created_by: 157 modified_by: 157 dcm_id: 310 url_slug: "Living-will" meta_description: "Put your mind at ease when making a living will with step-by-step guidance from Rocket Lawyer. This advance decision allows you to set out specific instructions for medical treatment you would and would not like to receive. " time_to_complete: "20 minutes"
How can I make an Advance Decision legally binding? Include a statement which clarifies that you would like the Advance Decision to apply even if this puts your life at risk as a result (this statement is covered by the section in this document entitled moral reasons for making this living will). You can also (optionally) ask your GP to sign a statement confirming they are aware of your Advance Decision. Either way, make sure that your GP, any relevant medical staff and/or your relatives know you have an Advance Decision and where to find it. More than just a Living will / Advance decision template, our step-by-step interview and guidance makes it easy to create your document. Easily create online, download, print and sign your free Living will / Advance decision in minutes. This document is also sometimes called: Advance decision and Advance directive.